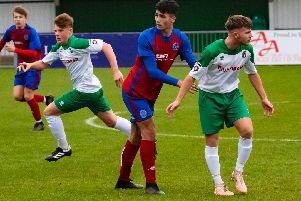 A dose of deja vu seemed on the cards for Chichester City until supersub Sam Ndlovu grabbed a late equaliser for the premier leaders against plucky mid-table opponents who were the better team on the day. Chi were 6-1 winners in the reverse fixture in September but Peacehaven have proved tricky hosts for Miles Rutherford and Graeme Gee’s side, who have lost 1-0 at the Sports Park the past two seasons. City were without forwards Scott Jones and Gicu Iordache. Steve Hutchings, the Moneyfields dual signing who featured last year in the FA Vase and the Sussex RUR Cup final, came into the starting XI up top with Ant Ender back in goal in an otherwise unchanged side from the one that beat East Preston last time out. Hutchings had the game’s first chance, heading wide in the fourth minute. Ben Pashley picked out Hutchings with a super pass but the No9’s touch on to Josh Clack was just a bit too heavy and Alieu Secka gathered comfortably enough. The hosts forged a couple of opportunities in the next five minutes. Callum Hart curled an effort the wrong side of the post following a slick move down the left before Marcus Allen got on the end of Peacehaven playmaker Cameron Wiltshire’s free-kick after Rory Biggs had been booked for a foul on Tyler Scrafton. City huffed and puffed and Biggs was instrumental in a counter-attack which set up Clack for a fierce attempt turned out for a corner. Secka flapped at it but the loose ball was hooked away. Another Biggs run resulted in another corner as the visitors pressed on the half-hour mark. Clack, with three goals in the past two games, tried his luck with a shot on the turn but Secka got a glove to it to tip the ball round for a third corner in as many minutes. At the other end Chi scrambled clear a Wiltshire set-piece before Ender did well to deny Hart before the break. Peacehaven took the lead four minutes into the second half when Curt Ford headed in Wiltshire’s precision cross at the back stick. Chichester had work to do as the home side, spurred on by a large crowd, sensed another scalp and cranked things up. Hutchings gave referee Ciaran Fidler something to think about after a strong tackle on Wiltshire – he brandished a yellow card. Next Hutchings went close with an effort after Secka spilled Haitham’s cross before Clack almost caught the Peacehaven keeper out with a lob on 65 minutes. Hutchings and Clack combined nicely moments later but Secka got his body behind the No7’s low drive. Chi introduced Lorenzo Dolcetti and Ndlovu for Dave Herbert and Biggs and with ten minutes to go Matt Axell fired a Dolcetti corner narrowly past the post. In the 85th minute Ndlovu hauled City back into the match with a smart finish after Hutchings fed him. There was still time for more drama when Chichester were reduced to ten men following a foul by Pashley on Hart who was through on goal. Lira lifted his set-piece from the edge of the box just over the bar. Then Lucas Tyrell could have won it for the hosts in time added on with practically the last kick of the game but he dragged his effort wide. It wasn’t pretty from Chi, but once again they found a way to pick up points with a late goal. Chichester: Ender, Peake, R Hutchings, Axell, Cody, Pashley, Clack, Biggs, S Hutchings, Herbert, Hiatham. Subs: Lewis, Dunn, Dolcetti, Ndlovu.